This beautiful orchid is native to Loas, Thailand, Cambodia and Vietnam. 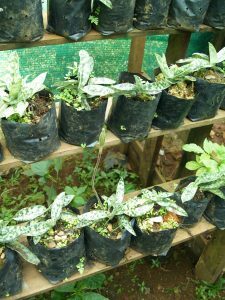 It grows as a terrestrial or lithophyte in deep shade in primary forest from 300-2000m showing that it can tolerate a wide range of temperatures providing it is kept moist and shaded. We find it to be one of the easier Paphs to grow and plants flower regularly each summer. 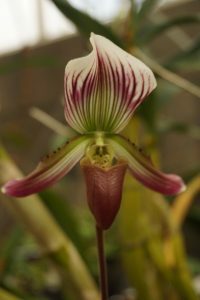 As with most Paphiopedilum species plants are unsustainably collected from their habitat and illegally exported and sold as cultivated plants. In Laos we have seen large amounts collected from South East Laos for sale in the markets of Thailand or sold to unscrupulous nurseries. This is a terrible shame for the survival of the species as well as destroying opportunities for eco tourism and development in a very poor part of the world. Orchids are easy to raise from seed and produce sustainably.